I have observed that there are two kinds of people in this world. There are people who dream of having one device that they can use in every instance, and there are, well, the rest of us. That’s a fundamental philosophical difference currently being presented by Apple and its competitors: Apple makes devices that it believes are better suited to particular use cases, while others—such as Microsoft—say that one device alone can do it all. Take the Surface, for example. (Really, Microsoft would love it if you’d take one.) Redmond’s pitch is that the Surface is a tablet and a laptop (assuming you buy the keyboard for $100 more). It runs desktop applications, but it’s touch-enabled everywhere. It slices, it dices, it juliennes fries. No compromises. 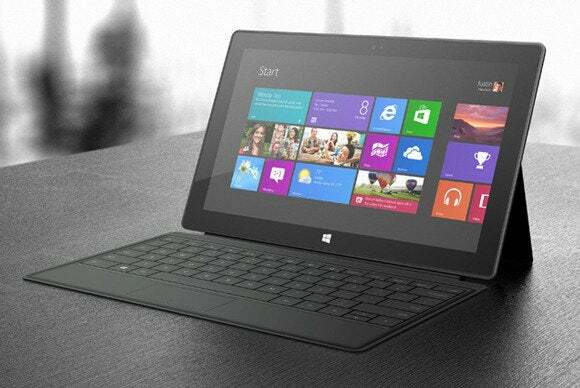 Microsoft's Surface is an attempt to find the holy grail of computing: one device for every purpose. “They can’t type. They can’t create documents,” said Gates. Now, in his defense, it’s possible he’s never used an iPad before. Or seen one. And he may also be unaware there are kinds of documents other than Word documents. The point is, Microsoft is selling the idea that the iPad is half a solution and the Surface is the whole solution. Of course, it’s not selling that idea very well, given the Surface’s sales figures, but we’ll get to that in a minute. Microsoft isn’t the only one with this particular vision. Another shining example is Ubuntu Edge, an Indiegogo project started by Canonical to fund a state-of-the-art Ubuntu phone that, when connected to a monitor, mouse, and keyboard would function as a full Ubuntu desktop. Just what you always wanted! And up until last year, Motorola was working on Webtop, a system that would give users the ability to dock their Android devices at their desktop and use them as PCs. So, this isn’t just a fringe group. Well, it may be a fringe group, but it’s one that uses a variety of platforms. Windows 8 proponents will wax poetic about the magic of being able to edit a document on your tablet with the onscreen touch keyboard whilst flying through the air and then, when you get home, editing it with a mouse and keyboard on the very same device. Well, OK, but this is 2013. Why not use Dropbox or iCloud or—hey, here’s an idea—Windows Azure and edit it on any device, with the input methods that are best suited to that device? Both these philosophies—the all-things device and the targeted devices—have their benefits. We do not presently live in an always-on-the-Internet world, or at least one where we’re always reliably on the Internet (see: air travel, or that beach you go to every summer). There’s a tradeoff between availability and optimization. If you don’t have the files loaded onto the device you have with you, you may not be able to access them on the plane. But after using Windows Explorer via a touchscreen, you’re also going to need to spend $10 on a drink instead of $8 on in-flight WiFi. Actually, I am. Because what you need is two different interfaces for each. You could put two different interfaces in an application and have it switch modes, but that’s tantamount to creating two different applications. The last ten years of computing have been all about the cloud, and despite the aforementioned Windows Azure, the Surface suggests that Microsoft doesn’t really get that. The crowdsourced Ubuntu Edge was an attempt to make a smartphone that could also hook up to desktop peripherals. To date, the all-in-one philosophy has failed miserably at gaining traction. I regret to inform you that the Ubuntu Edge appears set to fall short of its $32 million Indiegogo goal. But only by about $20 million. So close. This is one of the reasons why I think the cliché “open always wins” should be updated to “open can never fail, it can only be failed.” In this case by the open-source community itself. As for Motorola’s Webtop, that project was killed after the company was acquired by Google. Now, why would Google do that to the technology that some called “its secret weapon for fighting Apple and Microsoft”? Because Google’s philosophy is more like Apple’s: Don’t keep your stuff on your device, keep it in the cloud and use it on any device. For Apple it makes sense because Cupertino want to sell you more devices. For Google it makes sense because it wants the devices themselves to be unimportant—cloud services are its bread and butter. Well, really its bread and butter are ads. Cloud services are more like the plate it serves you the bread and butter on. Apple, meanwhile, doesn’t shy away from letting its devices overlap. MacBooks got smaller with the Air, iOS devices got larger with the iPad. But the company’s never telling you to just get one. Heaven’s sake, no: Selling devices is how it makes money. You’ll want an iPhone, an iPad, and a Mac. And, just between you and me, don’t you need an upstairs iPad and a downstairs iPad? Don’t you deserve an upstairs iPad and a downstairs iPad? Apple's philosophy embraces different devices for different use cases. Right now my personal computing experience happens on four devices; an iPhone, an iPad, a MacBook Air, and an iMac. I don’t have four devices because I’m made of money (I’m mostly made of water, or so I’m told); I have four devices because each is simply better suited to a different use case. It’s not that Apple’s (or Google’s) approach is perfect. Apple’s cloud solution is, shall we say, a work in progress. Talk to a developer about trying to implement iCloud in an app and you’ll get a four-letter-word laden diatribe that would have made Steve Jobs blush and then fire someone. But you don’t have to be a usability expert to know which of these two philosophies works better in 2013. All you have to do is see which one people prefer—and right now they prefer Apple’s.